Albert Dujardin Our father was born in Trier, Germany in 1925. The Mosel River ( which runs into the Rhine) was near his family home. He often explored the Porta De Nigra ruins that date back to the Romans. He and our grandmother immigrated to the United States in 1934. They lived with his Tante Gretel and Uncle Benno during his youth. Dad joined the Navy while in high school. 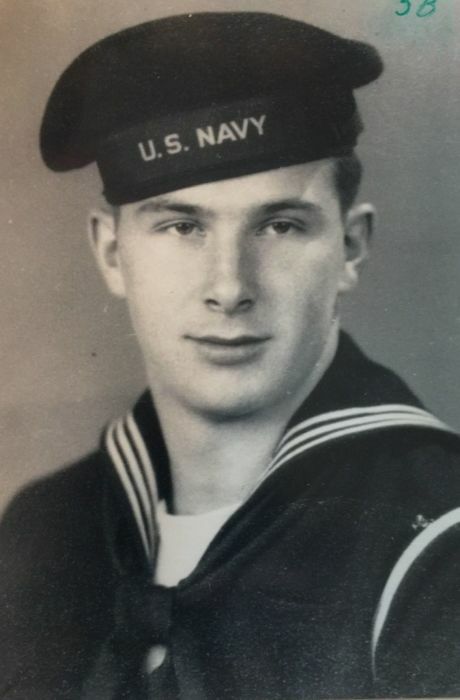 He proudly served his country as a sailor on the USS Black Fin during World War II. Stationed on the west coast he met and married our mother in 1945. We moved from Napa to Sacramento when Dad went to work for the telephone company. He was transferred to Chico several years later. We lived in a motel in Paradise that summer until our parents found a home for us in Chico. Dad was transferred one more time back to Napa in around 1959. He always made time for fishing, hunting, trips to the ocean, his beloved Mt. Lassen and Hat Creek cabin and his family. We are happy and grateful to have learned more about our dad, albeit later in life. He left us on November 27, 2018, eager to reunite with our mom. He is survived by his daughters, Diane, Susan (Ray), Barbie (Scott), grandchildren, Gretchen (Joe), Nicole (Mike), Nate (Deb, and Zack, great grandchildren, Sam and Sophia, and his New York cousin, Susan. Our father was predeceased by our mother, Barbara, our brother, David, our grandmother, Angela and numerous aunts, uncles and cousins. Our family will honor our parent’s wishes by scattering their ashes at sea. We are grateful for the care and love from the residents and staff of the Redwood Retirement Residence where our parents resided since 2012.